Mummy Pig is dressed as a fireman. – Mummy, why are you dressed like that? – I am going to the Mummies’ Fire Engine Practice. – Oh, oh, it’s just a good excuse for a cup of tea and a chat. – Well, what are you doing today, Daddy Pig? – I’ve got a very important meeting with the Daddies’ Football Team. – Ah, that’s just a lot of grown-up boys kicking a football around. – We are having a barbecue as well. – Here are Mr Bull, Mr Rabbit, Mr Pony and Mr Zebra. – Mooo, is Daddy Pig coming out to play? – Mummy, can we see the fire engine? This is Miss Rabbit’s fire station. – Hello, Peppa and George, come and see the fire engine. – There is a ladder for climbing, a hose for squirting water, and a big bell to ring. – Ding-dong, ding-dong. He he he. – Now, let’s go up the tower and look for fires. 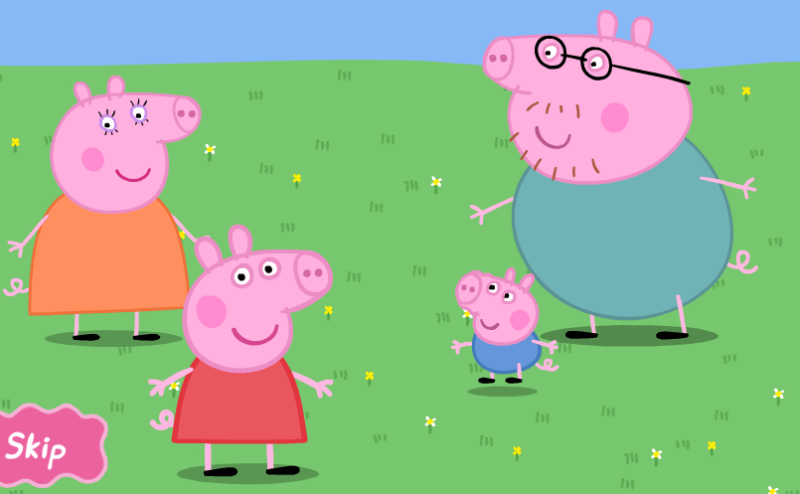 – Hello, Peppa, hello, George! – Ah, who is for a nice cup of tea and a chat? – Peppa, that is the fire phone. It’s only to be used when there is a fire. – Fire station, where is the fire, where is the fire? – Can I speak to Mummy Pig, please? – Oh, it’s Daddy Pig. – Ah, Daddy Pig, you are not supposed to ring on this phone, It’s only for emergencies. – This is an emergency, I can’t find the tomato ketchup anywhere. – Daddy Pig, shall I light the barbecue now? – Yes, please, Mr Rabbit. – Do be careful with the barbecue, Daddy Pig. – Trust me, Mummy Pig, we daddies know everything about barbecues. – Maybe it needs more charcoal? – Give it a bit of a blow. – Put a few more firelighters on. – Now, we just have to wait for a fire. – How long do we have to wait? – Oh, it could be a long time, I have been waiting ages. – How many fires have you actually put out Miss Rabbit? – Uh.. none, not 1 fire. But you’ve got to be ready. – It’s the fire phone. – Oh, can you answer it, Peppa, it’ll probably be your daddy again. – Oh, daddy, it is you, you are very naughty! This phone is for fires only. – Can you put Miss Rabbit on, please? There is a good girl. – Daddy wants to speak to you. Oh dear! Daddy Pig’s barbecue is on fire. – Fire, fire, ding-dong, ding-dong. – It’s Miss Rabbit’s fire engine. – Mummy Dog, turn on the water! – Ay, ay, Mommy Pig. – The fire is out. – Thank you for saving us, Miss Rabbit. – No problem. It’s all part of the service. The Mummies’ Fire Engine Service. – And now that Miss Rabbit has kindly flooded out our garden, we can all jump up and down in muddy puddles. – I love fire engines, especially when they make muddy puddles.